Five Movies That Inspire Travel: Part 1. Films are huge part of popular culture and have the power to transform opinion, inspire change and excite the senses. There are numerous films which, over the years, have inspired us to seek out adventure and travel and these are some our favourites. The Darjeeling Limited [Blu-ray] – Director: Wes Anderson. We’re huge fans of Wes Anderson’s style and storytelling technique so it’s worth noting The Grand Budapest Hotel only misses the cut by way of being set in a fictional country (we might revise this in a later list!). 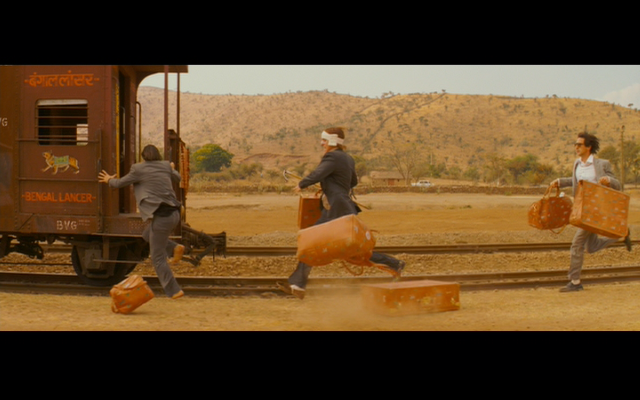 The Darjeeling Limited was, in a lot of ways a departure from Anderson’s previous filmography. The film essentially boils down to a travelogue/ buddy movie following three distrusting brothers on a long train ride through the stunning landscapes and culture of India. Anderson’s quirky hipster stylings are in full force as always yet the film is freer and more adventurous in tone. It’s also a lot of fun and the banter between Adrien Brody, Luke and Owen Wilson is smart, full of fraternal rivalry and ultimately love. India is a destination that we’ll hopefully reach this year and it’s obsession with spirituality and tradition is explored here much to the enlightenment of it’s characters. Lawrence of Arabia – Director: David Lean. The word “epic” is bandied around with free abandon nowadays but here is a story and film for which the term was apparently born. We follow T.E. Lawrence (Peter O’Toole in an outstanding, Oscar winning performance), a celebrated military figure during the First World War in the British Army who became a leader amongst Arab rebels, fighting against the Turks in the Arabian Desert. Lawrence himself was an extremely colourful character and his loyalties are blurred throughout. A key scene in the film sees Lawrence being hailed by a British soldier from a road across the dunes. The question is asked “who are you?” to which Lawrence falters… it’s a powerful moment and makes us question the concept of identity. The film itself is vast in scope; the deserts of the Middle East echoing exotic stories of exploration and nomadic cultures while the story itself glimpses at just one chapter in a region where millennia of past events and the importance of identity clash contributing to complexities which still exist today. Lean crafts a masterpiece which is captured in captivating grandeur by (another winner of the film’s seven Oscar haul) cinematographer, Freddie Young. Christopher McCandless’ true story is well known in travel circles and the book is deservedly a worldwide best seller. The film is no less inspiring and follows Chris, university Honors student and athlete as he plans to leave his suburban life and go off on a journey of self discovery in to middle-of-nowhere parts of America. His tale is all about shedding the superficial and material elements of life (including $24,000 worth of savings which he donated to Oxfam), putting what you have on your back and seeing what the road brings. The twist however comes at the end which isn’t necessarily a happy one. Questions arise. Does material wealth bring happiness and if not then is sacrifice and physical struggle a worthy alternative. One of the conclusions- that happiness is best shared- can be attributed to all aspects of life, especially travel when you can be on your own for extended periods of time. Emile Hirsch is excellent and fully immersed in the role, performing the majority of what you see on screen for real (including a scene with a bear) while transforming himself physically for the more desperate scenes. Brilliant and thought provoking. Indiana Jones – Director: Steven Spielberg. First of all, we’re including Kingdom of the Crystal Skull in this list because even though the overall package is markedly inferior, these four films still stand as the ultimate adventure series and Crystal Skull still features some cracking moments- one of our favourites being the fight on top of an ancient temple in the Peruvian jungle. Crystal Skull is notable for it’s lack of overseas shooting with most of the film being shot in the United States or digitally. Do look out for shots of Iguazu falls in Brazil/ Argentina though which were used as part of a bigger, mostly digital scene. Returning to the original trilogy, we have to recognise Raiders of the Lost Ark, The Temple of Doom and The Last Crusade as leagues ahead in quality and masterpieces in old school serialised storytelling from a director who defined a generation of filmgoers. If you haven’t yet watched any Indy films (get on it immediately!) they follow the archaeological action heroics of Indiana Jones (Harrison Ford on classic, dry form) during the late 1930’s to the 1950’s when long sea voyages in submarine killing zones and propeller aircraft were the primary ways to get from A to B as he repeatedly leaves his job as a professor of history to retrieve priceless cultural artifacts from those who would use them for evil (Nazis/ Soviets/ Indian death cults etc). Indiana Jones (or Henry Jones Jr.) is a brilliantly sketched character and believably human as he constantly goes out of his comfort zone to explore the wildest places on Earth. Even with the potential for danger lurking in every shadow he still has time to marvel at the sights he dreamed of seeing since his childhood. Unforgettable scenes in Egypt, Jordan, India, South America, Germany, Venice and Nepal will light the fires of adventure inside of you whether you’re eight or eighty years old. Although, due to movie magic some of these scenes were filmed in completely different countries (Nepal in Elstree Studios for instance), Spielberg’s smart, dynamic direction, Douglas Slocombe’s cinematography and John Williams’ score elevate each shot to such a dizzying level of beauty and at the same time invoking the spirit of the destination so eloquently, that we believe we’re right there beside our titular hero. The brilliance of this series is it’s use of worldwide cultures and destinations, imparting historical fact alongside religious mythology and pure fiction to breathe life in to what could be generic storytelling. Becoming fascinated by ancient civilisations and the wonders of the world that still stand today is part of the allure. They also push the boundaries of PG rated films. Melting faces, aircraft propeller death, monkey brains, decaying knights, hand-extracted hearts and more all feature but that’s part of the fun and if we ignore modern day film rating guidance we have to realise that kids lap this stuff up! We did. Many films have tried and failed to match the formula (Stephen Sommers’ first entry in the otherwise lacklustre “The Mummy” series actually comes pretty close) and yet Indy, priceless treasure in hand, cracks his whip at the young pretenders, jumps on a horse and gallops in to the desert sunset. Now it’s your turn. Like Indy, start charting your next adventure. Maybe use a red dotted line for your flight path and buy a fedora before you leave… If there are any films that have inspired you to travel r if you simply want to chat about the ones featured here then let us know in the comments below or on our Facebook page. Disclaimer: This post features affiliated links but rest assured that we only provided links because we love these films and want to share them with you and if that raises enough funds for a couple of beers on our trip then great! Thanks! It’s subjective of course however it’s funny how often the same films seem to crop up on these lists! What are some of your favourites?